How to pull the trigger. I wish I had a time machine. Over the years I’ve talked to scores of people who would wistfully start the conversation, “I really want to start my own company, but…” The “but” would be any one or combination (if they’d really been agonizing over it) of financial, emotional, psychological self-justifications for not making the leap, not pulling the trigger. Something dies inside yourself when fear gets the better of your dreams. 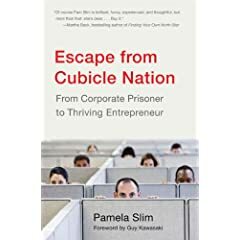 That’s why I want that time machine – so I can go back, force into their hands a book that goes on sale today: “Escape from Cubicle Nation” by Pamela Slim (Amazon, non-affiliate link). Pam has created the SERE guide for all those trapped in other people’s companies who yearn to get out, but need practical, insightful advice on how to do it. This isn’t a compilation of her great blog, Escape from Cubicle Nation: it’s an detailed, comprehensive plan/study guide/manual for successfully making one the biggest transitions in your life. One of Pam’s great gifts is her gentle wit and results-orientated approach to helping you see there’s a good, workable, doable answer to every one of the “buts” that have kept you chained to your job. Of the four sections of the book, (Opening Up to Opportunities, The Reality of Entrepreneurship, Making the Money Work, Making the Leap), I especially like the material covered in the second section. Pam gets into the nitty-gritty of the people side of becoming an entrepreneur and offers sage advice on dealing with mitigating the disruption that happens to those relationships. I especially liked Chapter 7, “Recruit Your Tribe” that lays out just how to build the network of supporters, advisers, mentors and constructive critics every startup or microISV needs to succeed. Some may argue that quitting your job to start a new, untested, company in the midst of a global recession/depression is suicidal. It certainly is if you do it before reading this book and before working through the steps you need that Pam lays out in detail. If you’ve been reading this blog for a while or my other writings, and you’ve not moved forward towards that dream inside you to be your own boss, please, spend a few bucks and get this book: it’s that good. The transition can, and most likely will, be tough but IF you’re up to it there is nothing better than being your own boss doing work that you love to do anyway. I also recommend The Business of Software by Eric Sink however that book applied to me as my move was to create a small Independent Software Vendor. By the way, I would strongly urge anyone who is NOT willing or able to put in many hours of seemingly unpaid time to NOT breakout on your own. Entrepreneurism is not for the classic clock-watching working-for-the-weekend person. My book order has been placed. Thanks, Bob. Thanks so much for your wonderful review and recommendation Bob! I have really relied on you over the years to give me the inside scoop on starting a business pains in the Micro ISV world. I appreciate your support so much, and am glad that you are serving as a resource to a community that needs someone to lean on when times get tough! Onward and upward, may we all bounce out of this recession with renewed clarity, vigor and focus to do the work we are meant to do.